You can find the best Craigslist proxies in the table above which currently is IPLease and HighProxies. Please note that SSL Private Proxy is also great, but they are more expensive than the other two and SSLPP is sometimes sold out. IPLease: Fast and excellent proxies for posting to Craigslist. SSL Private Proxy: Expensive, but very reliable proxies with high quality for Craigslist. Don’t forget to use one of these discount coupons! Why Use a Proxy for Craigslist? Craigslist started in 1995 as a local email distribution list among friends. Since then, it has expanded operations to 570 cities in 70 countries across the globe. It has more than 80 million new postings each month, making it the top classified service in the world. This makes it a very lucrative place to post ads promoting your brand and reaching new customers. One of the biggest perks of using Craigslist is that it is the closest thing to free advertising you can find. In most places, creating an ad is free, though if you are posting in certain areas in the United States or Canada, you may have to pay a small fee of about $5 to post your ad to the “Gigs” section. This pales in comparison to fees changed by other classified services, making Craigslist an advertising platform with a fantastic ROI. Since its inception, Craigslist’s focus has been to act as a local online marketplace. As a result, there are measures in place to prevent you from posting in regions that are not geographically close. For example, if you live in New York, Craigslist prevents you from posting an ad in Dallas, even if you are promoting a service or product that easily ships. Data scraping is a very useful way to use Craigslist without spending hours on the site itself. People often scrape data for a few different reasons. One of the biggest ones is to keep an eye on certain items and their prices. Then, when an ad is posted for a sought after item at a price you find agreeable, you can contact the seller to make your purchase. This is a great way to find items for resale, like event tickets, old toys, and antiques. Other people data scrape to make the entire Craigslist experience much easier. If, for example, you are looking for a laptop, have very specific requirements, and are willing to travel to make the buy, data scraping can narrow down the results, focusing only on those laptops that meet your specifications. Marketers also use data scraping for lead generation purposes. By setting up your proxy, you can look through thousands of posting, searching for people who need the exact service or product you happen to sell. From there, you can make a contact sheet and start getting in touch with potential leads. Needless to say, as useful as data scraping is, using those tools is prohibited by Craigslist. The company actually goes out of its way to locate and block accounts that utilize those tools. A proxy is the only way around this policy without risk. Another way Craigslist fights spam on its site is by blocking multiple similar posts originating from the same IP address. While there are situations where this policy makes sense (no one wants to see 200 ads for the same 2016 Chevy Volt all over the site), it can be quite restrictive to those who are posting ads for services or multiple goods online. When it comes to promoting your brand, reaching as many people as possible is your ultimate goal. The easiest way to post multiple ads in multiple categories without getting banned is to use a different Craigslist proxy for each new post. Quite a few companies have very restrictive internet settings, intended to keep employees on task while at work. These settings often block access to numerous social media platforms and websites like Craigslist. While you should always focus on work when on the clock, there is nothing wrong with checking Craigslist on breaks, especially if you are trying to get a second career or separate business off the ground. A Craigslist proxy is the best way to get around your workplace blocks, giving you access to the site and preventing your boss from knowing how you spent your lunch break. In some cases, Craigslist may flag your account for phone verification. This can happen if you do post a few ads at once, even if they are all for different items. For example, Craigslist prohibits VoIP numbers, which many people use as a low-cost alternative to landlines, from being used. Using a proxy is a great way to get around this issue, as it greatly reduces the risk of having your account flagged for verification. Craigslist has a lot of rules when it comes to what you can post, when you can post it, and the words you can use within your ad. Unless you spend a lot of time reading the terms of service, you may accidentally run afoul of those rules. The trouble is that Craigslist doesn’t really care if you violated its terms on purpose or not; it is going to ban you nonetheless. Unfortunately, it bans by IP address, not by email account. Using a proxy can get you back on Craigslist, despite the prior ban. Choose Your Location. Since Craigslist is location-based, being able to choose the location of the proxy address is crucial. This is how you can post your ads to Chicago when you are based in Los Angeles. Before buying your package, be sure that the provider does have IP addresses available based in your desired locations. Fresh IPs. Using a proxy to post on Craigslist is not a new concept; people have been doing it for a while. As a result, if you want to avoid your account getting flagged, it is important that fresh IP addresses – ones that have never been used for Craigslist – are available. Refresh Option. Refreshing your proxies is the best way to avoid getting flagged. Using the same ones multiple times can attract unwanted attention. Make sure that the proxy package you choose gives you an IP refresh option. Most of the reputable ones refresh your proxy addresses once a month or so. 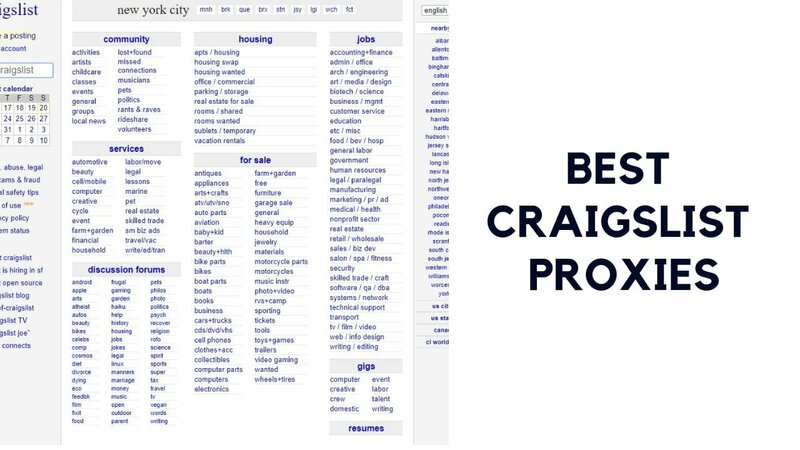 Once you start using your proxy package to post your ads to Craigslist, you need to be sure that you behave perfectly to avoid having your ads flagged. Any scrutiny or close attention paid to your account could reveal your proxy use, which almost always results in a ban from the site. Of course, you can then start to use different proxy packages, but the ban also removes all your ads, forcing you to start over from scratch. It is far better to practice good Craigslist use instead. Wait about two to five minutes between posts, even if you are using a bot in connection with your proxy. Craigslist is a powerful tool that can be used to get your brand out in front of millions of people across the globe. Make sure you do so safely, without getting banned or blocked, by using a proxy.